These green rounded commercial mats are great for office lobbies and other high traffic areas because they absorb dirt, water and mud. 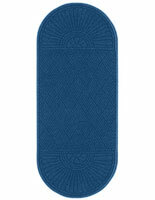 This type of entrance carpet features polypropylene fibers on a rubber backing for slip resistance. The rounded commercial mats measure 4' x 8 and are anti-static rated at 1.2KV by the AATCC. The flooring is easy to clean when using a hose or vacuum cleaner.